Do you want to know the best inflatable paddle board? Of course you do. Let me help you single out the best of best right now. Mirror, mirror, on the wall, which inflatable stand up paddle board is the fairest of them all? When it comes to finding the best inflatable SUP boards, the most important thing you want to look for is quality at a reasonable price. You also want to look for a board that comes with the full package (paddle board paddle, leash, pump, fun, etc.) so you don’t have to buy any additional gear to start your adventure. Lastly, free shipping and some other bells and whistles are just a few extra bonus points to make you feel good about your purchase. 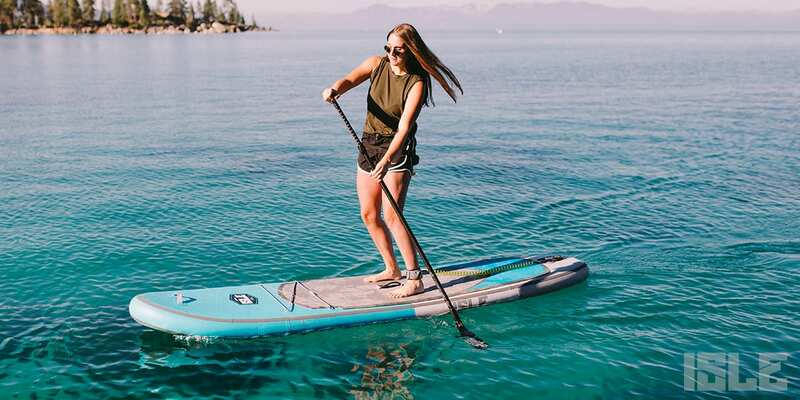 Before we tell you about our favorite inflatable paddle boards, it’s important to know the difference between inflatable paddle boards and epoxy paddle boards. The reason why people are choosing inflatable paddle boards over epoxy boards because they are more portable, storable and durable than epoxy SUPs. All inflatables deflate to this size of a rolled-up sleeping bag which make them super easy to store at your house and in your car. As for the durability, you can drop your board as many times as you want (even throw it) and it will not be damaged. If you want a more in-depth explanation of the difference between inflatable and epoxy, read this. As mentioned earlier, the best stand up paddle boards are made of quality materials at an affordable price. Keep an eye out for inflatables that are constructed with high density, dual or double layered military grade PVC. Military grade PVC layers will make an inflatable feel just as rigid as an epoxy paddle board when inflated to its suggested PSI. This technology is also super durable making it difficult to scratch or damage the surface of your SUP. 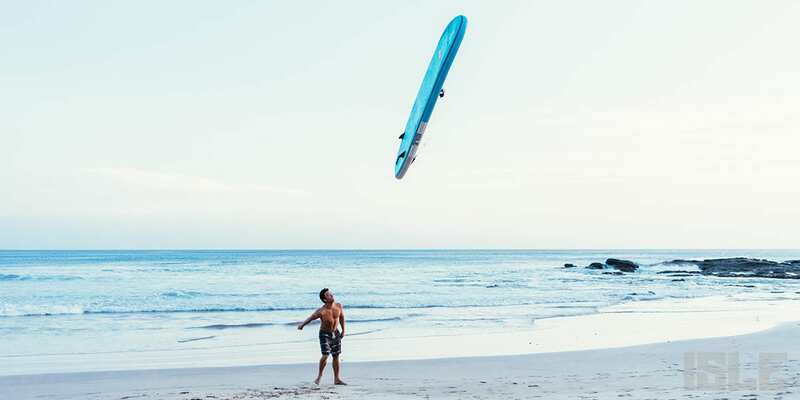 The All Around Inflatable Paddle Board is the most affordable, versatile inflatable you can get your hands on in today’s water sport market. This inflatable SUP can be used for recreational paddling, SUP yoga, SUP fishing and SUP surfing in small to medium sized surf. It’s ideal for all water conditions (lake, bay, river or ocean). 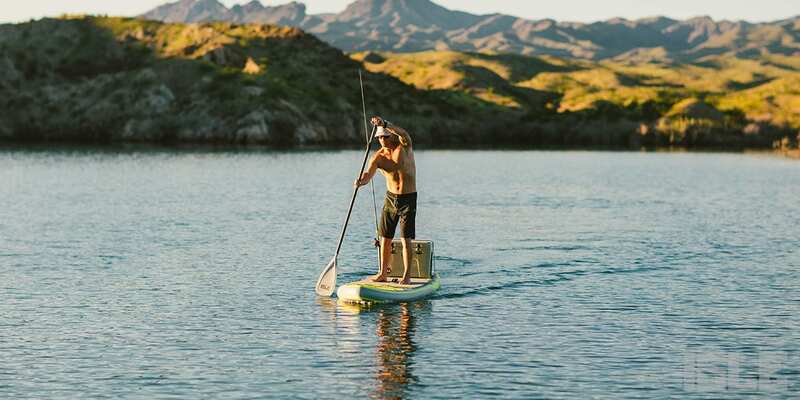 This paddle board is a fixed size of 10’6 inches which is a great all-around length for most people and light enough to glide the world’s water with. “My wife and I purchased two All Arounds (blue & aqua) to celebrate our 13th anniversary and to start exploring the PNW coast together BEST DECISION EVER.” – Phira R.
“Everything in the package is great quality. I’ve taken my All Around out a few times already. Stability is great, the padding is comfortable for the feet. I like the top front handle, very useful. The bungee rack has rubber where the knot is – super secure. Hand pump is great quality, as well as the backpack. A lot of padding for easy carrying. 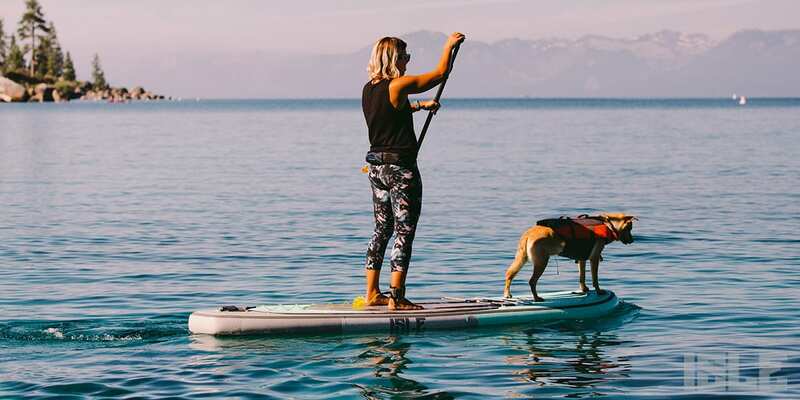 This is my first paddle board and I couldn’t be happier.” – Marie M.
With a pulled in nose and a traditional touring style shape, the Explorer Inflatable Paddle Board is the perfect paddle board for the adventurist. The Explorer has an increased rocker which makes paddling in any type of chop much easier because the nose cuts through the water like a Great White. 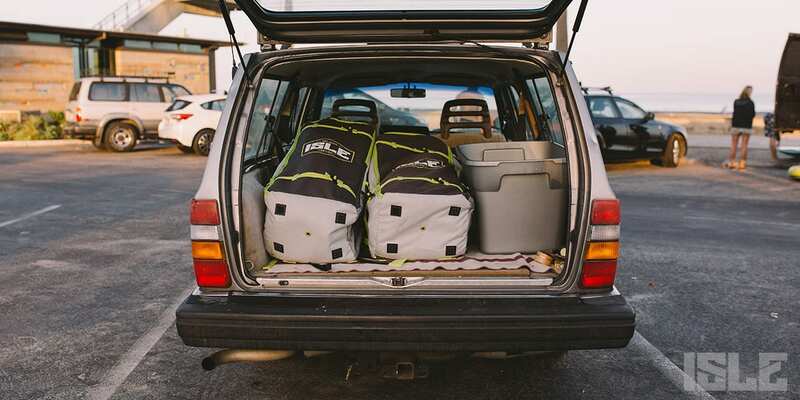 Want to take a bunch of gear on your inflatable with you? The Explorer has two sets of bungees and multiple stainless-steel D-rings so you can strap down and secure dry bags, water bottles, fishing rods, snorkeling gear or maybe your cooler for a meal/cold beverage on the water. Also, bring your pup on board too! “When I buy a product, I always look for the best. When I was searching for an inflatable paddle board, I just kept coming back to the Explorer. Once my wife and I started using the Explorer, we were amazed by it! It is durable, sturdy, and glides across the water. If you want the best with no compromise, then look no further with the Explorer.” – Kenon D.
“We purchased 2 Explorers this month and had the opportunity to take the maiden voyage on Echo Lake at Acadia National Park in Maine. Everything from the boards to the paddles exceeded our expectations. They are stable and quite attractive. We look forward to years of use as we travel around the country in our RV.” – Paul V.
Why paddle solo when you can bring your friends, family, and pets along? The Megalodon Inflatable Paddle Board is supersized SUP that is crafted with the weight of multiple people in mind. It has extra handles, comes with multiple paddles and enough room for 4-10 people. The more the merrier with the 12’ or 15’ Megalodon. Share a party wave, host a party barge or use it as a floating swim dock. The world is your oyster with the Megalodon. “Who needs a boat when you have this water beast?! I have a boat but found myself on the Megalodon basically the whole summer. I usually use it with my husband and we always have plenty of space for a cooler and each of us can sprawl out. It’s amazing, you need this.” – Stephanie K.
“We wanted something the whole family could enjoy together, and this fits the bill PERFECTLY! While we are all native San Diegans we now live in northern Nevada so lakes are now our playground and we (and a lot of our friends) have thoroughly enjoyed this board. It’s our ‘party barge’ and hands down our new favorite water toy. We debated which one to get and finally decided the 15’ would work for us. So happy with it!” – Wendy O. The Lotus Inflatable Paddle Board was designed for SUP Fitness. If you didn’t know, SUP fitness is trending right now, and tons of paddlers are doing SUP Yoga, Pilates, and Barre on their paddle boards. The Lotus has a wider outline compared to all the other boards and with that has extra stability, durability and buoyancy for those technical workout and yoga flows. The brushed comfort grip covers most of the deck to give you ample space for any workout you take on. SUP Yoga, SUP Pilates, etc. 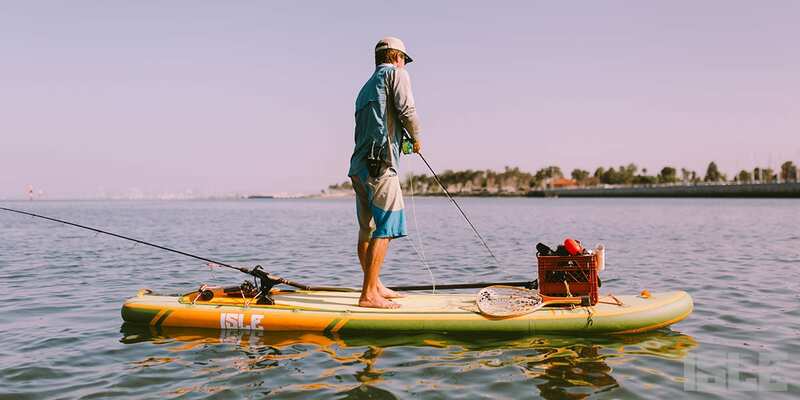 Stand Up Paddle Board Fishing is the newest niche so we designed the Sportsman Inflatable Paddle Board specifically for fishing. The Sportsman has a little wider template gives the board maximum side to side stability and maneuverability for casting and reeling in the catch of the day. In addition, this board comes with Scotty Mount attachments, so you can rig it up to your liking; add rod holders, bate plates, gopro mounts or possibly a drink holder to carry a cold one on the water. “Took this out on a maiden voyage and caught a lot fish. Very happy with my purchase and convinced a few others to buy one. Great board!” – Daniel L.
“I’ve never owned a SUP. I’m 6’4″ 265 lbs and obviously I weigh more than most boards can support comfortably. I also have a kiddo that I wanted to be able to take on the board plus the set up for fishing was a seller for me. I’ve used the board for fishing, cruising and taking my kiddo on runs and I’m extremely pleased with my purchase. I just wish I would have bought 2. 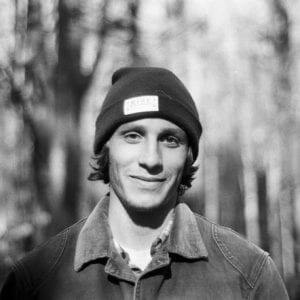 Great board for big riders.” – Blake P.
Finding the best inflatable paddle board is simple when you know everything to look for. You want an inflatable that is constructed with double or dual layer military grade PVC. You also want to compare price points of all these quality inflatables to find the most affordable. Hint: You can find these high-quality inflatables for under $1000. Next, be sure to look for a board that comes with the full paddle board package (paddle, leash, fin, pump, etc). Lastly, follow your heart and we’re sure it will lead you to find the perfect inflatable paddle board.